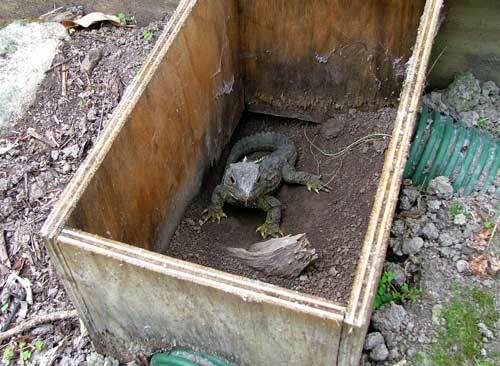 Eight adult tuatara were caught in the wild on Little Barrier Island (Hauturu) in 1991 and 1992, and put in enclosures to protect them from kiore (Pacific rats). Little shelters were built inside – this one has its lid removed so you can see the tuatara. Green drainage pipes provided a way in and out. In the 1990s the adults bred. Their eggs were incubated at Victoria University of Wellington, and the hatchlings were then returned to the enclosures on the island. Since the island was declared free of kiore, in 2006, some of the juvenile tuatara have been released into the wild on the island.